Roofing is your home’s first line of defense against the elements – These features serve the vital task of keeping you and your family safe, dry and protected inside. And with an average ROI of 67-70%, new roofs are one of the best home improvement projects around. How do you choose the right roof for you? A superior roof is only as strong as the sum of its parts. To ensure durability and protection, each aspect of your roof – the underlayments, shingles, accessory products and ventilation – all need to work together in harmony. At Top Dog Home Pro, we are proudly accredited with the title of CertainTeed Shingle Master Company. 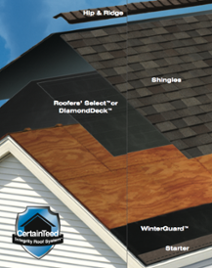 A CertainTeed Integrity Roof System is designed for optimum performance – no matter how bad weather conditions can get. Shingles, underlayments and accessories are of superior quality, translating to longer lasting roofs. In addition to our title, we are proud to offer the CertainTeed SureStart Plus Warranty to protect your home for years to come. Additionally, as most residential roofs are sloped, the aesthetics of chosen materials should reflect your personal style and flow with the design of the rest of the home. CertainTeed Roofing offers a wide selection of residential roofing shingles that are as beautiful as they are durable. Choose from a variety of options – from designer to luxury or traditional – in the most sought after colors, textures and styles homeowners demand today. These not only adds value to your home today, but is an important aspect should you decide to sell in the future.